With Michigan down 7-0 early in the first quarter against Notre Dame and showing little in the way of offensive production, Rich Rodriguez used a little trickeration to get the Wolverines on the scoreboard. At this point, you probably know how Roy Roundtree ran completely unabated to the endzone after a Denard Robinson play action pass, but the way in which it developed is a little more intricate and shows a lot of foresight by Rodriguez. Michigan debuted a play that I've referred to as the QB stretch, where, rather than following his lead blocker and running between the tackles, Denard would follow his lead blocker outside the tackles. 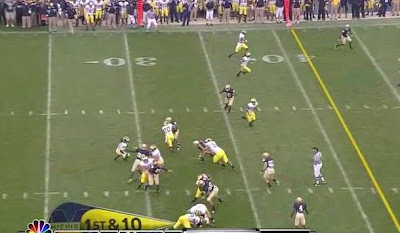 Michigan is in a 3-wide, 1-back set with tight end Kevin Koger lined up on the weak side of the play. 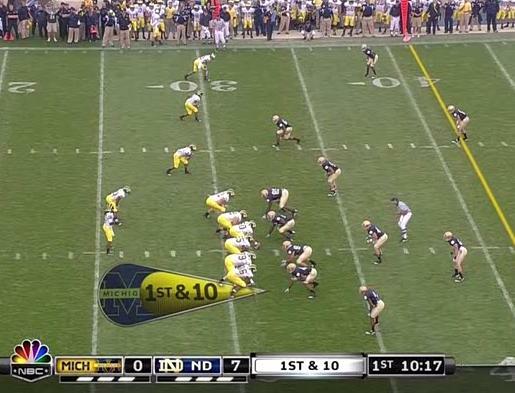 Notre Dame is in a basic 4-3 coverage. One of their linebackers is shaded over Michigan's receivers and the playside cornerback is playing 8 yards off the line of scrimmage. On the snap, Michael Shaw heads outside of the tackle to block the middle linebacker; Michigan is purposefully leaving the playside, outside linebacker unblocked. David Molk and Steve Schilling quickly double team the playside defensive tackle and Schilling releases to the second level to block the weakside linebacker. Notre Dame's safety and cornerback are dropping back into coverage because the playside linebackers are spying Denard and sitting on the run. This is the brilliant part. After the Roundtree touchdown, one of my friends questioned whether or not the play was intentional or just a broken play. As you can see in the image below, none of the receivers are looking to block anyone downfield, something that they do excellently on almost all other QB draws. 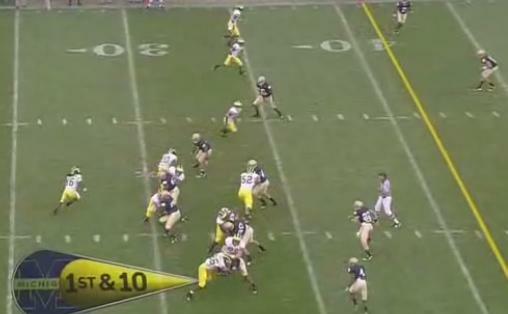 Here, they're just running three vertical routes against Notre Dame's two defensive backs. At this point in the play, Michigan isn't concerned with gaining yards. This was a fact-finding mission. 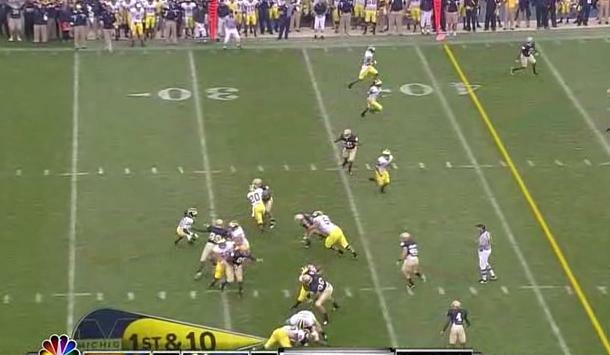 If Denard breaks this play for good yardage, even better. But right now, with the outside linebacker (standing on the 35 yard line between Michigan's receivers) already selling out on the run, Rodriguez knows that the next time they show this play, they can score with a simple play action pass. 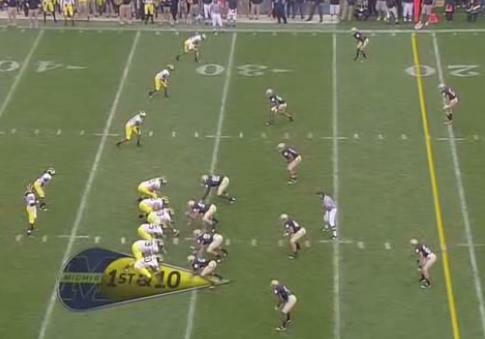 You'll see that Michigan and Notre Dame are both in nearly identical pre-snap formations as the last play. The only difference is the depth of Notre Dame's weakside safety who is a few yards deeper. On the snap, Vincent Smith (who was subbed in for Shaw on this play) heads outside the tackle to block off the middle linebacker as they did in the last play. 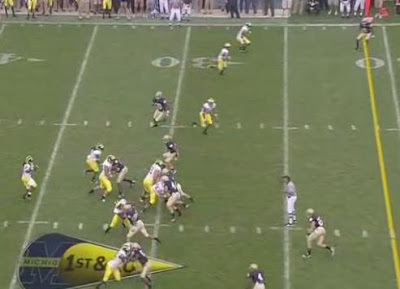 In this instance, the playside, outside linebacker, who was unblocked the last time Michigan ran this formation, immediately comes up on the play to stop the run because he's "seen this before". 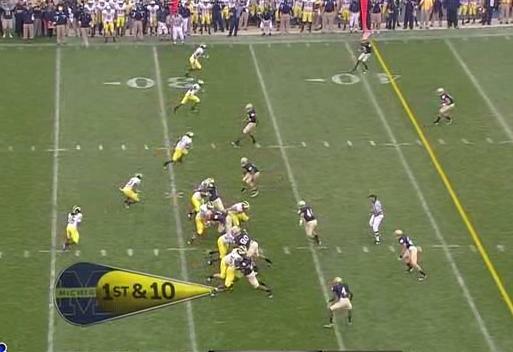 Once again, you can see Michigan's receivers unconcerned with blocking downfield. They run right past the second level defenders and have only two players to beat, both of whom are between the sideline and playside hash; the middle of the field is wide open as we'll see. Before the play, you could probably say Notre Dame was toast, but this is the moment when all of the players on the field realize it. Denard knowing full well this was a passing play the whole time, sells the run effectively and is squaring his shoulders to hit any one of his free receivers running downfield. As mentioned above, the middle of the field is wide open, so a quick seam route to Roundtree is all that's needed before he's off to the races. Brilliant breakdown. This play was awesome to watch in person because even if you aren't a great football mind it was clear to see the open targets from the start. In fact, Michigan lined up with 3 WRs on one side quite often, and ND never seemed to match up man for man at the line of scrimmage. However, in the second half at least, they seemed to take away the down the field routes, but it appeared Michigan exploited this with more Robinson running and more out routes. this is like mike debords old plan of building tendencies against poor opposition so as to break them against good opponents. the nice thing is that this is on a much smaller time frame, and requires far less effort. Wow. Great find. Love the analysis. Thank you! I never thought of football as a game of chess, or a rope a dope, but this is brilliant. This beats 3 yards and a cloud of dust any day. Yeah, it's 87 yards and a cloud of dust! Thanks for the breakdown, very informative. 3 & Out sheds some more light on this. Rodriguez wasn't setting anything up on the first time they ran this. 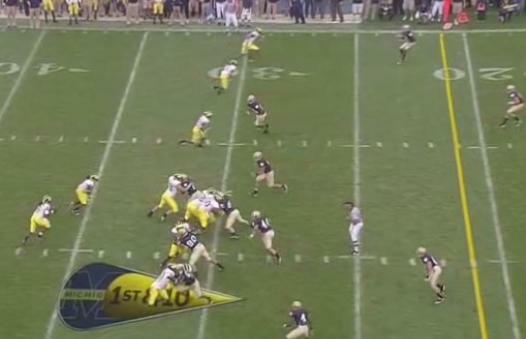 It's a called play but Denard does have the option to keep and he biffed it the first time around. Either way...I miss Denard on the outside zone and what can result. Such a stress on the D.